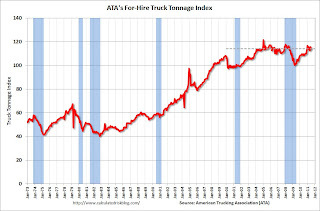 The American Trucking Associations’ advance seasonally adjusted (SA) For-Hire Truck Tonnage Index decreased 1.3% in July after rising a revised 2.6% in June 2011. ... The latest pullback put the SA index at 114 (2000=100) in July, down from the June level of 115.5. Compared with July 2010, SA tonnage was up 3.9%. In June, the tonnage index was 6.5% above a year earlier. “We had heard that freight weakened from a robust June, that that was true,” ATA Chief Economist Bob Costello said. Tonnage has fallen in three of the last four months on a sequential basis. “Despite a solid June, our truck tonnage index fits with an economy that is growing very slowly,” Costello noted. When the June index was released it was already obvious that July would be weak based on comments from UPS and others. August will probably show a decline too.